Here’s a wonderful photo of my late father Maurice with my brother Raymond. Raymond looks about 14 months old, so it’s probably July or August 1971. I think I took the picture (or maybe Mom did). I have a few vague memories of that day: the weather was good and we obviously decided to take snapshots of ourselves. (There are other similar photos in the series.) Could it have been Dad’s birthday, August 2nd? 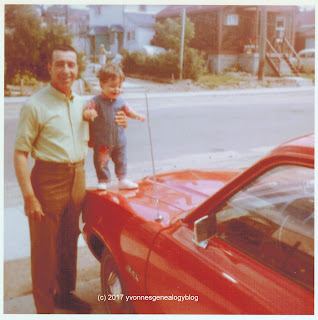 He and Raymond posed in the driveway of our rented duplex on the corner of Main (now Belanger Avenue) and Wilcox in Timmins, Ontario. Whatever the occasion was, I love this picture. Dad is happy, Raymond is so cute, and it’s one of the few examples of them together in a photograph.